Stiffened valances seem to go in and out of style. 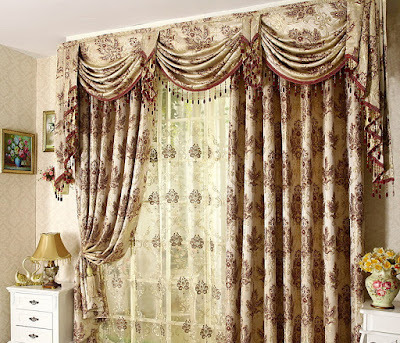 Just a few years ago a formal valance was considered very old-fashioned, but today with increasing use of elaborate period decor, the more formal valances are good once more. 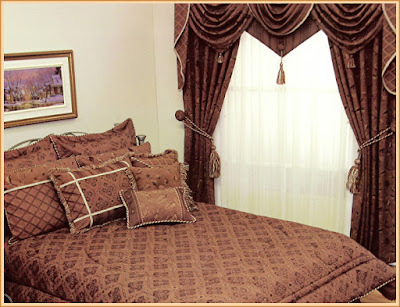 This also holds for the draped valance with jabots, a treatment most adaptable to formal rooms using satins, taffetas, and other rich fabrics. A valance board is very easily constructed by mounting a shelf about 3/8 % inch thick and four inches wide on a 4 inch metal corner, which is fastened to the wall with screws or toggle bolts. To make a stiff valance, cut a pattern the width of your window from a piece of stiff brown paper or muslin. Make it as deep as you think correct, remembering that deep valances cut down the appearance of height and may seem overwhelming in a small room. The usual depth is from one-sixth to one-eight the length of your draperies. Fold at the center to make the curve symmetrical; if you want a curved valance, make the curve deeper at the center and cut a graceful swirl. With your paper pattern as a guide cut your buckram or canvas stiffening the same size and shape. Cut the side piece the width of the side of your shelf, or valance board. Bind the raw edges of the buckram so they won't pierce the fabric of the covering later. Place this buckram pattern on your fabric and cut around it, leaving about an inch-wide border all around, that you will later turn over. You can then cut a matching piece of cotton padding, although this is optional, and a matching piece of sateen lining, the size of your buckram pattern. Lay all together, placing the fabric right side up, the lining right side down, and the stiffening on top. Stitch along the lower edge, and turn so that the stiffening lies in between. Overcast the top and ends, tucking in the raw edges as you sew. A welting along the edge of a shaped valance increases the look of good tailoring. Baste the welting between the fabric and the lining before machine stitching all the layers together. The welting should be turned so the round edge is inside and all the raw edges outside, in order to have it fall correctly when it is turned right side out. Another finish for this type of valance is a moss fringe, applied along the front four edges to give a boxy look. Sew a strip of twill tape across the back of the lining with strong thread, and then use this tape to tack the valance to the valance board with wood snappers or thumb tacks. 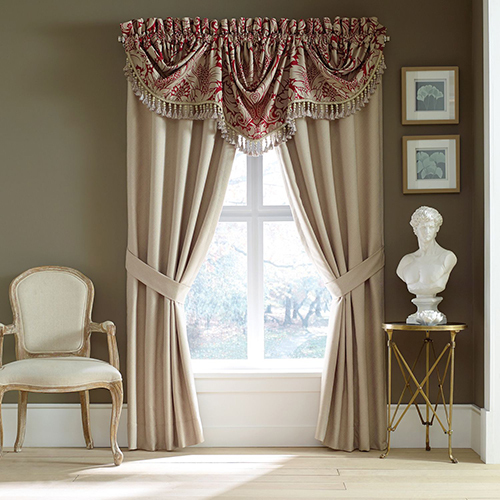 You can use a rod instead o a valance board for a softer effect, using a plain rod or a double rod on which your curtains hang, too. In this case you leave a slot or opening for the rod to pass through, or provide a casing with heading as for a curtain. For a gathered or shirred valance of this type make the valance about twice the length needed for the width of the window. Double the depth needed, and add a seam allowance. Crease the material down the center and fold on the crease lengthwise, turning the right sides together. Sew one side and the top, leaving an opening large enough for your rod to pass through at each side, near the top. Turn inside out, so that the fabric is now on the right side on both front and back, and sew the remaining side. Then seam a casing for the rod. When adjusted to the rod this should result in a generously shirred valance, with heading. 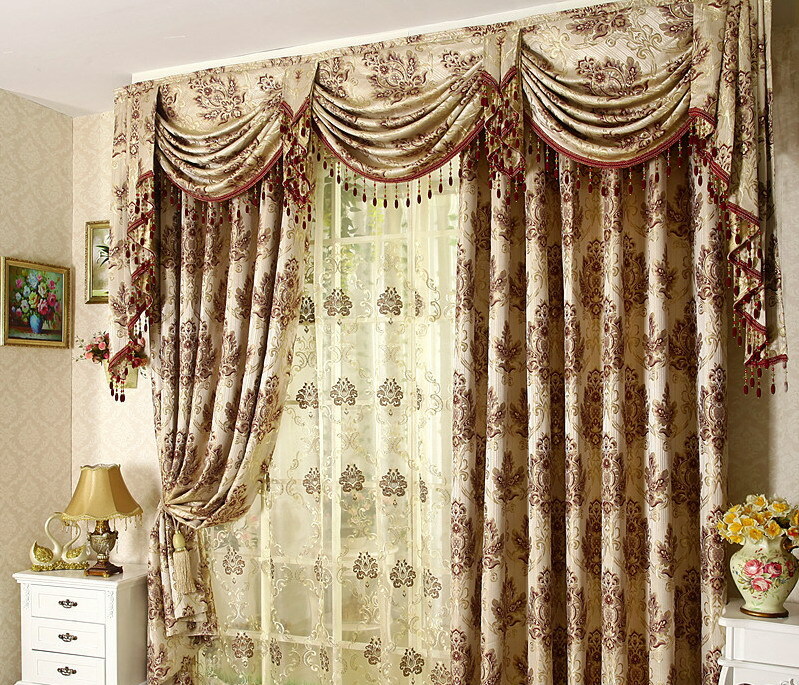 Ruffled valances may hang from a rod in much the same manner. If you wish to have two or three rows of ruffles, apply them to a plain foundation of muslin or sateen, made in the same manner as a plain valance. The pleated valance is made in the same way as a regular plain valance, except that you must allow at least a full length more of material for the width. Take the width of your valance and allow another full length for pleating. Allow sufficient fabric at each end for a seam and for the sides. That is, if your valance is to be 36 inches, your fabric should be 72 inches wide. From that width, subtract the width of each side (let us say they are each 3 inches deep). This leaves 66 inches for pleating, and means that 30 inches of pleating can be used in the pleats. It is clear that the length of the fabric allowed for each pleat must be twice what you wish the pleat to be. If in our assumed valance we wish to have 10 pleats, by dividing 10 into 30, we have 3 inches to use in each pleat, and each pleat can be one-half of 3 inches deep, or 1% inches. Next divide the numbered pleats into the width of the valance. This will give us the distance between each pleat In our valance this would mean dividing 36 by 10, or 3%th inches between pleats. The first and last pleats will be at the corners of the valance. After pinning the first pleat at top and bottom, the center of the next pleat will be equal to one-half the width of the pleat plus the distance we have already found necessary to leave between pleats. Fold the pleats in on the pin marks, pressing them as you fold them. Then stitch them so that the folded edges facing one another are caught firmly together, and to reinforce this make two rows of stitching across the back of the entire valance. Hooks for attaching this type of valance to a cornice board can be sewn into the stitching reinforcing the pleats.